Weaver's Gunsmith Deluxe Tool Kit enables you to turn your workbench into a professional Gunsmithing station. Whether mounting an accessory, punching out pins to replace a trigger, or separating a stock from a receiver the Deluxe Kit offers the exact tools for the tasks at hand. The complete set gathers together all the essentials, plus an impressive array of bits and punches. Weaver &apos;s Gunsmith Deluxe Tool Kit enables you to turn your workbench into a professional Gunsmithing station. Whether mounting an accessory, punching out pins to replace a trigger, or separating a stock from a receiver the Deluxe Kit offers the exact tools for the tasks at hand. 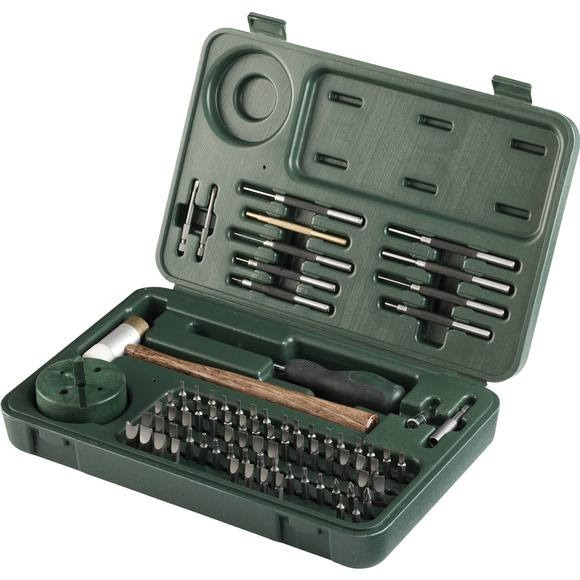 The complete set gathers together all the essentials, plus an impressive array of bits and punches. As well as a driver, hammer and much more.